Science and technology have promised many things over the years, including the end of human problems (such as war and overpopulation) and overcoming the problems and limitations of nature (such as disease and gravity). More often than not, these promises fail. Science fiction films are about the promises and failings of science and technology, and they offer a renewed emphasis on science and its power by placing science and technology themes at the center of plots and storyline. 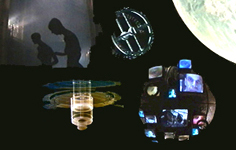 This web site uses stills, audio clips, and textual analysis to examine the realm of science fiction film through the lens of the following science and technology themes: alien life, space travel, time travel, computers, robots and man made life.
. last modified: Jul 20, 2000 .